Limit 3 reward claims per household, customer or address. 1. Retail purchasers only. Offer excludes commercial, fleet and group purchases, employee changeovers, teammate purchase card discounts and warranty replacement purchases. Valid in Canada only. Void where prohibited. Must be age of majority, or over in province/territory of residence. No special orders or rain checks and cannot be combined with any other offer. 2. Customer information collected herein is solely used by Bridgestone Canada Inc (“Bridgestone”) for internal marketing purposes and for the administration of Offer, and to contact the consumer if we have express consent. Bridgestone and its agencies are not responsible for (a) late, lost, altered, forged, illegible/garbled, inaccessible, corrupted, defective, postage due or misdirected submissions regardless of cause, or (b) technological problems/malfunctions/failures of any kind. All decisions of Bridgestone are final. 3. 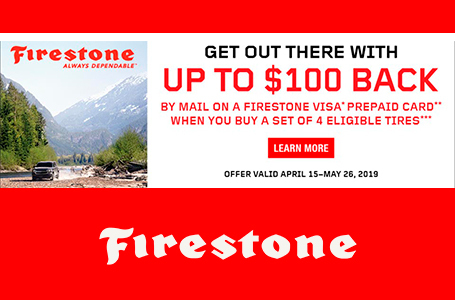 Firestone Visa Prepaid Card issued in connection with a promotion program. Card is issued by Peoples Trust Company pursuant to a license from Visa Int. *Trademark of Visa International Service Association and used under license by Peoples Trust Company. No cash access or recurring payments. Card valid for up to 6 months, unused funds forfeit at midnight EST the last day of the month of the valid thru date. Card terms and conditions apply; see MyPrepaidCenter.com/site/visa-univ-can.